Depeche Mode. Discography. Music. Albums. Tracks. Depeche Mode were originally founded in 1980 as a synth rock band in the town of Basildon, England. They have been one of the longest-lived and most successful bands to have emerged during the New Wave/New Romantic era; many of their videos have been heavily rotated on MTV. As of 2005, it is estimated that Depeche Mode have sold over 70 million albums worldwide. They have influenced many of today's popular recording artists, in part due to their innovative work, recording techniques and use of sampling. Their 1990 album Violator is considered a gem of electronic music. Though influential in the modern techno scene, they remain in the alternative genre. 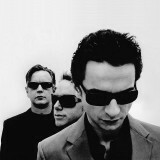 The three current members of Depeche Mode are: Martin Gore (primary songwriter, vocals, guitars, keyboards), David Gahan (lead vocals), Andrew Fletcher (management, keyboards). Former members include: Alan Wilder (producer, keyboards, drums, vocals), from 1982 to 1995. Vince Clarke (primary songwriter, keyboards), from 1980 to 1981.